Funny – who knew I’d learn to rake sand, to fluff it up but keep it even? Who knew I’d fill in the spaces between circles for hours one early Wednesday morning in my 34th year of life? We never know what’s going to happen to us. Our futures are unpredictable, even when we make the decisions we do, as I did when I signed up to volunteer to help artist Jim Denevan with his latest piece, part of the Vancouver Biennale. I awoke early in the morning. 6am. It wasn’t a work morning – I wasn’t heading to the office. Instead, I found myself traveling from one end of Vancouver, the far east, mere blocks from Burnaby, to the other end, the west, mere blocks from UBC. I decided to give myself a rare break, so I threw my bike on the front of a #4 bus, wisely investing in a $2.50 fare, and settled in. As the wind blew through my bike’s spokes, I caught up on some reading. Through Gastown, downtown, across the bridge to Kits… by 7:40 I was at 4th & Sasamat, some sort of pristine silent hilltop paradise. I haven’t heard that sort of silence in the city, ever. As I headed north on Sasamat, the hill quickly began to descend – everywhere in front of me were huge houses, parks, a lone hopping squirrel, and the early morning beach in the distance. I rode down, slowly, soaking up this neighbourhood’s vibe of upper eschelon peace. I was one of the first volunteers to arrive (about a dozen of us total), yet Jim was already far out on the beach. 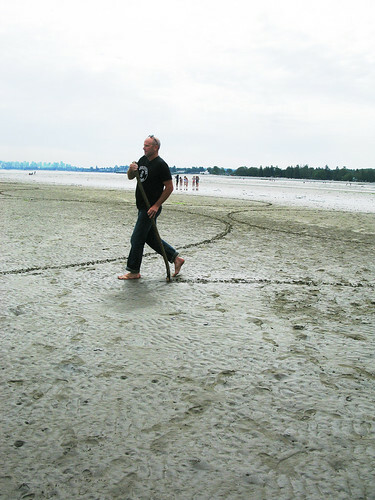 Taking advantage of low tide, his work had begun. I don’t think any of us knew exactly what we were going to be doing this promisingly warm morning. 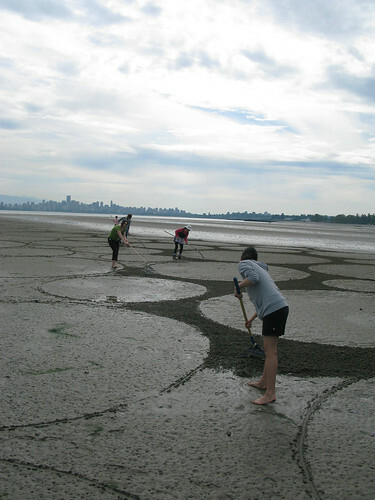 We had, in one way or another, found out that Jim Denevan, worldwide-known professional artist, was creating a new piece for Vancouver Biennale, and that he requested a few volunteers to help. I believe he normally does all the work himself, even though the scale of most of his pieces are huge. He has created the largest piece of art ever in the desert – check out the zooming map on his site – it’s utterly mind boggling. We began by setting up a small tent on shore with prints of Jim’s past work, as a base station for our operation, as well as an “info booth” of sorts for passerbys to today’s project. While we were introducing ourselves, setting up the tent, and slapping on sunscreen, the artist was busy drawing circles – many many circles – far out toward the waterline. Jim Denevan’s work is often temporary – he creates art in nature, not introducing new elements, rather, working with what exists, and today was no different. Jim was drawing in the sand. Superhumanly, though, he was drawing circles of all different sizes, and perfect circles at that. Drawing a perfect circle freehand on a piece of paper is quite tricky (try it right now – I dare you). Often it will be almost perfect, but something will be wonky – it’ll stretch out too far on one side, or the connection won’t quite match. But Jim seems to have an incredibly powerful inner compass, and all day long, from 7:30 till 12:30, he drew. With a tall stick, this tall man picked a spot, honed in on his centre, and then paced in a perfect circle, dragging his tall stick in the sand, creating the line that would meet up, perfectly each time, to complete a circle, some five feet in diameter, most 10 or more feet, some easily 30 or 40ft. Our job as volunteers was to support Jim’s physically arduous day by putting our backs into it, too. We were handed thin wire rakes – they felt old fashioned to me – and told to rake the spaces in between Jim’s circles. By raking, the sand broke up, almost fluffed up, and it darkened because we were releasing the wet, deeper sand to the surface. 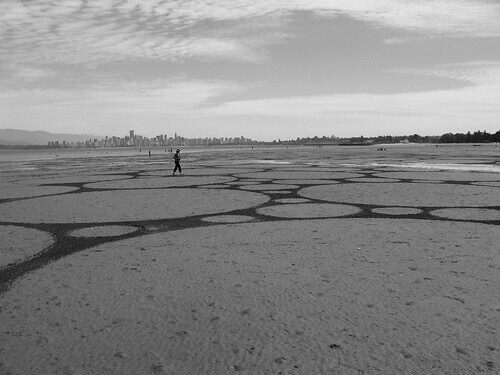 All along Spanish Banks, the volunteers were completing an integral part of the art piece – we were simultaneously adding two types of contrast – value (light circles vs dark between) and texture (smooth circles vs rough between). 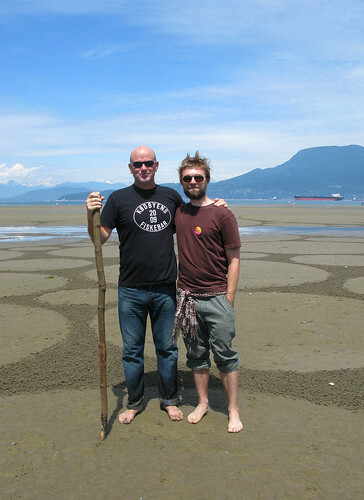 The idea with Jim Denevan’s work is to alter nature by drawing into the surface – sand, earth or ice. 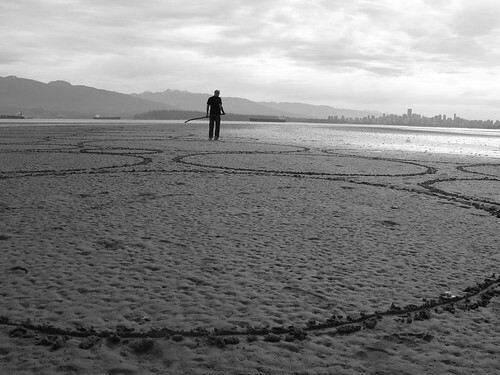 His work is called “temporary drawing” and his piece on Spanish Banks was especially so – his work was to be created and washed away in the same day. Actually, it only existed in its completed form for a few minutes, because it took all day to create (work began before 8am), and as it was finished (at 12:30), the tide began to reclaim it (I was told that some pictures were taken as the tide came in, and that the drawing could be seen through the shallow water!). This day was more for me than simply working with a professional artist, which was the original reason why I volunteered. I wanted to observe an artist at work and to be part of his creation. But what I did not expect was to experience so much more. The physicality of it all. Raking all day long is not an easy task. But being active, as I’ve mentioned in the past, is something I enjoy a lot. I enjoy feeling my blood rush through my body, I love feeling my muscles heat up, really feeling my hands, limbering up my joints. Having my bare feet in sand all day was a touch-sense overload! I loved it. Plus being out by the water, in the fresh air and sun for all those hours was magical. I spend a lot of my time indoors, on my computer, so I truly appreciate these days of being active, getting away from my crouched-at-the-desk position to move my body. The group of people that arrived to help Jim were all amazing. Everyone was happy, excited, and proud to be part of a special event. No one complained when we were told we’d be raking in between the circles. Instead, we struggled with this surprisingly challenging task (raking sand so that it doesn’t clump into mountains, striving for an evenness, is tough!) together, trying new techniques and sharing the successful methods with each other. We found a Zen state as the repetitiveness of the task sunk in – it was compared to those mini-Zen gardens – until JIm told us to speed up or else we’d lose to the tide. Jim and his assistants are amazingly down-to-earth people. This day restored my belief that artists do not have to be pretentious stuck up elite, who believe they are better than everyone else because they can communicate their voices. Most of us have a deep seated dream to find our voice – a way to express ourselves. Even if no one listens, we all want a way to say what we think and we feel in a way that is uniquely us, because it feels good to feel connected to ourselves. In the rare times that I have made that connection with my true voice, there is a sense of satisfaction, a sense of being in my place in the world, that is unlike anything else. But this sense of being special, of being unique, can be taken to an egotistical extreme, and there was none of that from Jim or his assistants, Molly and Christy. This added an unexpected level of enjoyment that made the day enjoyable in a refreshing way. This is somewhat related to lack of pretention. Art, separate from the artists who create the art, can be pretentious. There is a sense that art is precious, that every piece of work should be framed and never touched – hell, some people treat it like it should never see the light of day because light can break down the paint, for example. While I love art, and appreciate that we do not want to treat art pieces like old socks, the glowing barriers that are placed around art, especially the art of those artists who are magically deemed “important” artists, can sometimes be taken to an extreme. For example, I have trouble with sculpture. What is sculpture, if not a physical, three dimensional medium that begs to be touched? Yet we cannot touch it, for if everyone touched it, the damn grease in our collective hands would prematurely age it. Or some jackass would break a figure’s finger off. Long ago, I experimented with making one-of-a-kind drawings, then taping them to street posts, knowing they would get ripped, postered over, or rained on, and that I would never see them again. But I wanted to release myself from the high-class, framed and behind glass treatment of art. I never took that project very far, but I see the same purpose in Jim Denevan’s work. He knows his work will not be around forever, yet he stills creates. And he obviously loves doing it. Though it doesn’t hurt that he has fantastic photographers who fly up in helicopters to capture his work, and through those photos, his work will be immortal. The future is unpredictable. Being involved in THE MOMENT is a choice. On a wonderful June morning in Vancouver, we took in our moment and lived it, breathed it, sweated it, and soaked it in fully. What a cool experience. Thanks for all the great photos and wonderful story. The project reminds me of zen gardens with the raked stones, and it’s such a great use of sand. Wishing you more great opportunities. Thank you for the compliments, Leslie. I took a look around your blog, and it gave me greater appreciation for your comments, since you focus on zen. I, too, wish great opportunities for you.